Had some really good trips this past week speckled trout ,redfish , and drum. The wind has still been giving us some trouble blowing in the mornings limiting where we can fish but the fish are there and set into summer patterns. June should have some calmer winds and bigger trout too. Dan Hare and Group of 4 on board wind blowing and black Bay rough and dirty things looked bleak for awhile until we found some cleaner water along the shoreline of black bay. The bite was slow but steady we worked the shoreline and filled the box with trout,reds,and drum. THE CATCH: 60 trout,3 reds,10 drum. FRIDAY: Romero group on board which is always a good time. Started out in Black bay water was dirty and wind blowing again. Went to the east and found cleaner water and speckled trout we hit 3 areas and had 88 trout but the rod was bent the whole morning about a 3to1 catch keep ratio. Left the trout biting and hit 3 spots and put 7 reds and 6 drum on top to finish out the day. THE FISHING IS IN FULL SWING AND WILL ONLY GET BETTER IN JUNE, SO CALL ME AND BOOK ATRIP ANF GET IN ON THE CATCHING AND FUN. The first 2 weeks of November have been phenomenal. 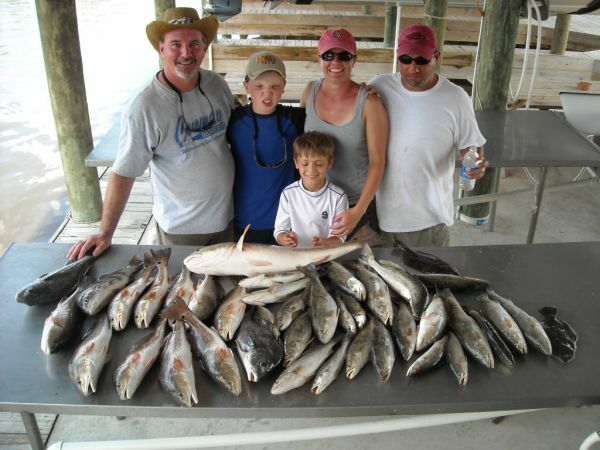 The speckled trout and redfish are biting and the fall migration of ducks to the marsh is in swing. First weekend of Nov YOUTH ONLY waterfowl hunts were great I took my kids Daniel and Sarah and two friends Eric and Stew. The kids had blast and so did I watching them. Did some fishing in between lots of trout and redfish. Nov 12 opening day regular duck season was great . My oldest son Jacob in from College to hunt with us. 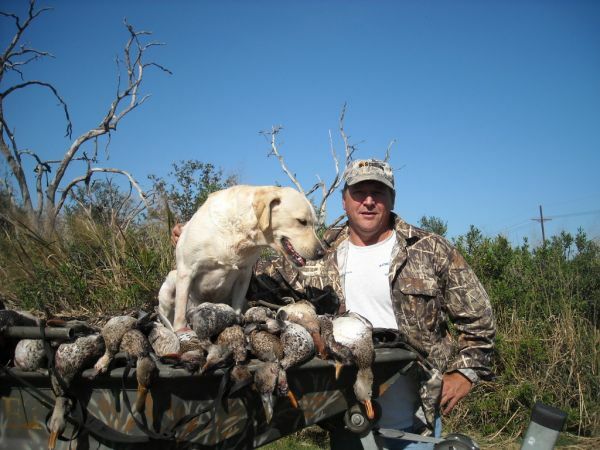 Saturday and Sunday limits of ducks. 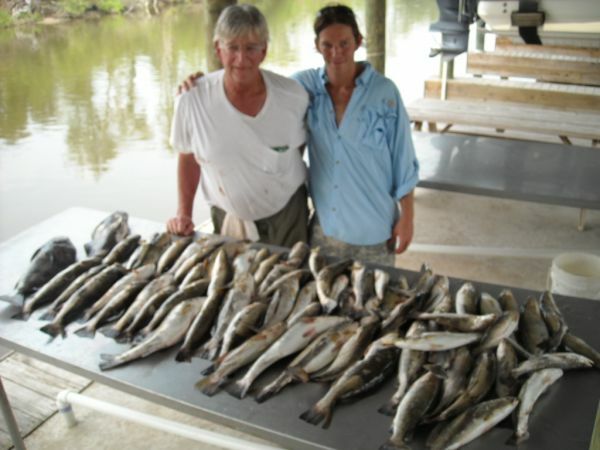 LOUISIANA TRULY THE SPORTSMAN PARADISE!. The ducks are here and the fish are biting. 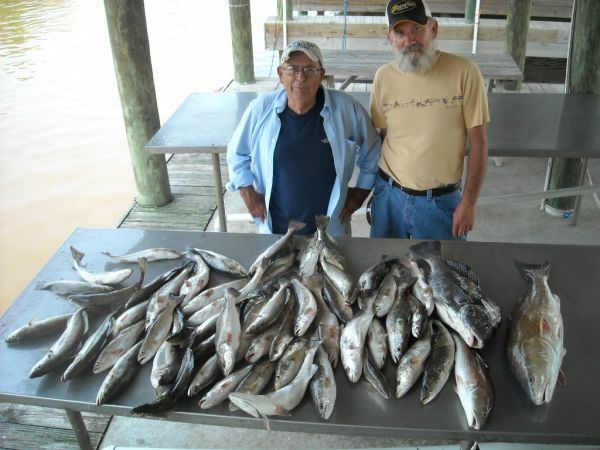 Hopedale LA fall Fishing is ON! Saturday fishing in Hopedale was great The weather was beautiful cool with a light breeze. Had two boats out today Myself and Capt Tony. The day started a little slow but got going quick Specks and white trout mixed that turned into all whites with chartreuse plastic on corks and on the bottom. Left the whites to look for some bigger specks bite was slow but steady boxes were filling up. 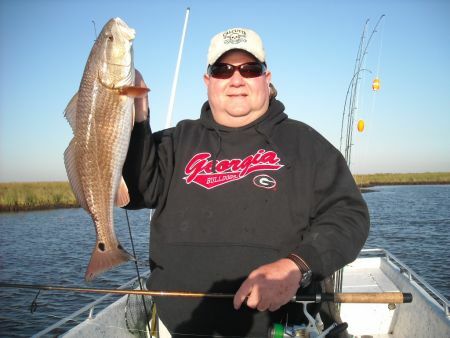 Tried the reds at several spots but real slow or too small but out a few nice drums in the boat. Called it day around 1 to get in time for my group to watch the LSU GAME. GEAUX TIGERS!. 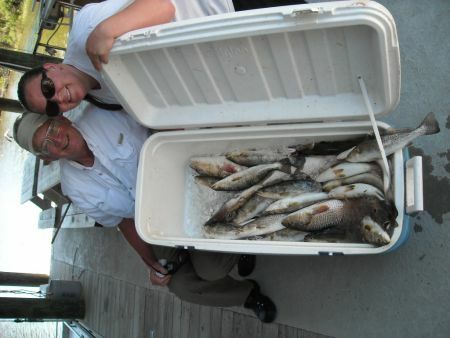 Anyway it was great day on the water with both boats catching a lot of fish not limits but a good boxes and a lot fun. 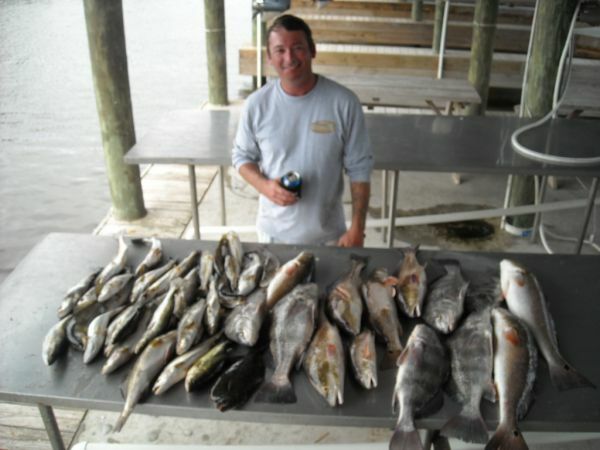 Monday Ray Huntzicker and the MARSH FEST had one spectacular day with box full of trout redfish and drum in the 20+ mph wind. Teusday back at it again with AJ Dempster and his Dad and Don. Started off right in the trout then they stopped cold with little to no bites for over an hour till we found them tearing up a school of shrimp. Finished up and left them biting. THE FISHINGIS ON IN HOPEDALE GIVE US A CALL AND COME CATCHEM UP! I have several openings Your boat is reday and waiting..
Evan and Scott had a great time fishing Saturday out in the sound. Calm sea and hot temps along with a nice box of fish. Things started slow and stayed slow most of the morning we had to pick up a frw trout at each stop to build box of fish. Talk about HOT TOO. With 40+ quality trout in the box we headed for the marsh to try for red or two. Made a couple of stops and found them at the last one putting few reds and 1 drum in the boat and head for the barn for some shade. We fished hard and had a nice box of big trout to show for it. 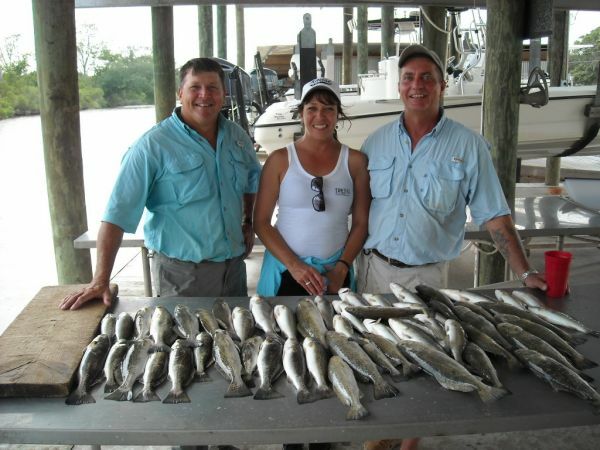 Ray Huntz and Richard back on board for another great day fishing Speckled trout in Hopedale LA. Ray had to take a break from fishing due to a minor surgery but from the pictures you can see he is back to his angling self. 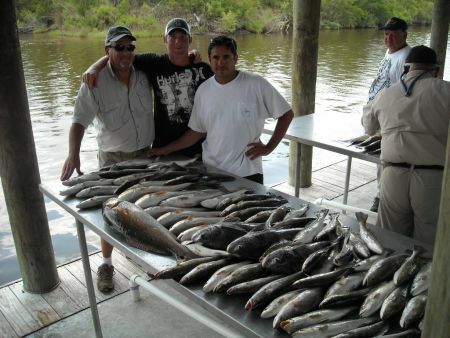 Ray and Richard had an awesome trip all nice trout and a few redfish to top off the day. Good to have Ray back in the boat again. All fish caught with campo live shrimp under a cork 2 ft deep. Half the group went back after trout and did well just few short of a limit the rest after trout for a little while but Doug wanted the kids to catch some reds so I left plenty of time to get some in the boat. We had to work at it but had dozen nice reds a few drum and flounder and 30 quality trout before calling it around 11:00 with no wind it got HOT! Anyway it was great trip for everyone. Both Days both boats with loads of fish for the trip back to Arkansas. I fished yesterday with Ross and his wife Lana and had a great day on the water. Things started just the opposite of what I wanted SLOOW. No tide no fish. We hit all the spots I caught on Mon and Teus plus some and at 9:30 only 8 fish in the box. Keep on fishing persistence pays. I made a big move to another area and finally got on some trout but it did not last a few more moves and we found some good trout mixed with schoolies but a good fish every three. Stayed there and finished up with their limit 50 trout late in the day 1:30, but we gotem nice box of fish on a tough day with some really nice people. 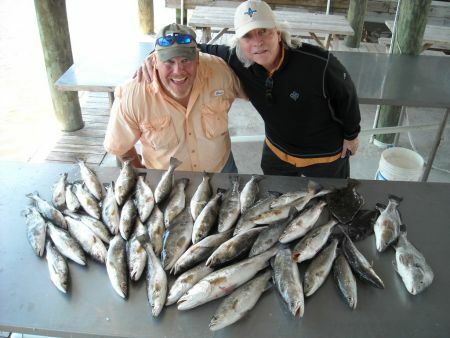 Another good day fishing in Hopedale La yesterday with Reynold, Doc, Ralph, and Jeff on board. Nice calm seas made for a smooth ride to the fishing grounds. Started on the trout right off but the bite was slow and that was the pattern for the day. Little tide movement meant we had to stay on the move and build a box. The trout were nice with several 3 lbs in the mix along with some reds and drums. Live Campo shrimp under a cork. 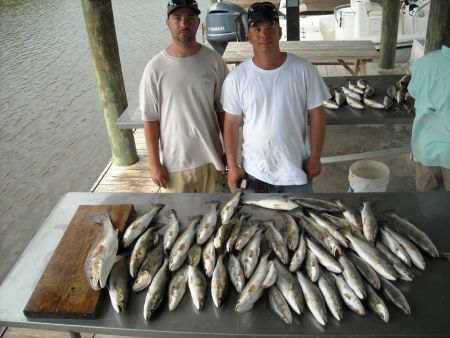 Skip and son Phillip put a smack down on the speckled trout. The first day the wind was down and I knew it was going to be good. Skip and Phillip are good fisherman and it did not take long for trout to come in the boat. It was a 3 stop trip and at 11:30 it was Africa hot and with the a limit of trout Skip said no red today lets head in. Live shrimp undera cork was the ticket! 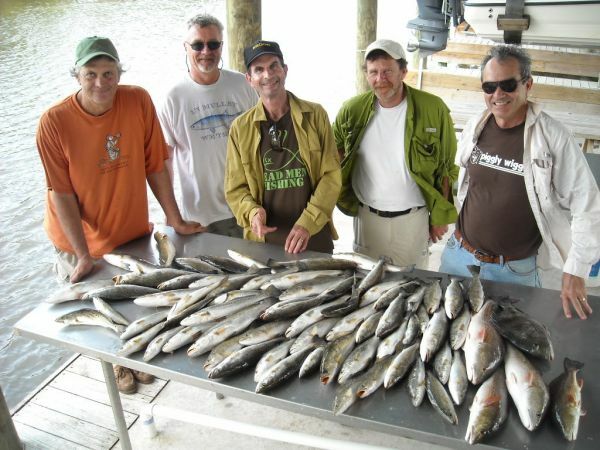 My friend Claude set up this trip for him and his buddies THE BROWN WATER GANG for two days fishing. We all had a great time and caught lot fish bith days. Great group of guys to be with. They are coming back again to make it an annual trip. The fishing is great in Hopedale right now and do not worry about the river water the trout and reds are biting. YOUR BOAT IS WAITING! Give me a call and come and catch some! Another great day on the water in Hopedale LA. 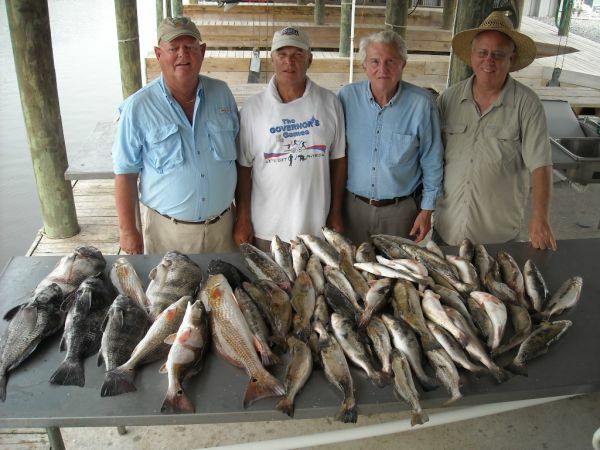 Yesterday Gerry, Les, Kevin and son Burke put a smack down on the speckled trout. Third stop was all it took live Campo shrimp 2 ft under a cork and some nice sized trout were filling the box pretty quick. The bite slowed down but we had plenty and Burke was ready to get some redfish so off to the marsh in search of reds. The reds proved a little tougher to find but we got few to bend the rod along with some drum and a flounder and called it a day and head for the dock with a box full of fish. Trout are Jumping in Hopedale LA. Another great week down in Gods Country Hopedale La. 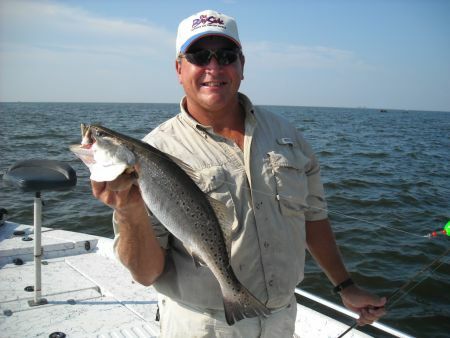 The speckled trout are biting steady and on the days when the wind calm down the trout bite has been fantastic. 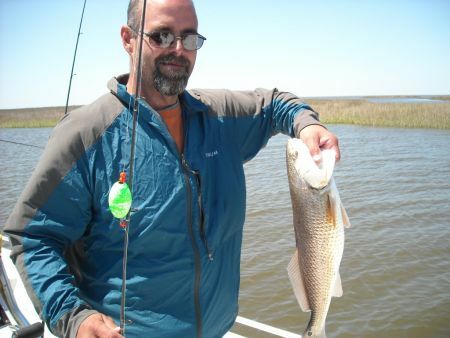 The redfish are scattered with the high tides and you have to keep on the move to get them . 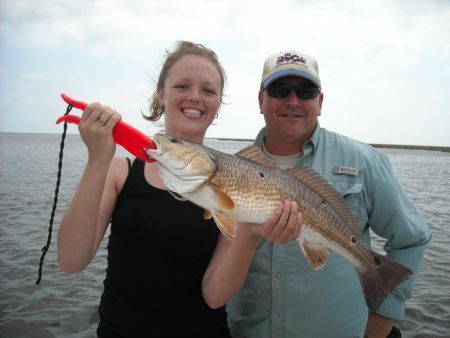 Live shrimp has been the ticket for both trout and redfish fished 2 ft under a cork. Looking forward to the rest of the month and hoping the winds calm down and it will be even better if you can imagine that. Any way get some live shrimp from Campos and go get em Or just give me a call and I will put you on them for sure. YOUR BOAT IS WAITING. GAURANTEED FISH! After seeing the marine forecast for Sunday NW wind 20to25 knots I called Larry and told him if he wanted to reschedule that was fine, But he said no way him and Robbie were ready to go along with Amanda and Kevin no matter what the weather. ALL RIGHT LETS DO IT! Well it was blowing and I had my work cut out for me. But we hit some birds in Hopedale Lagoon on the way out and put dozen in the box quick maybe today would work out. We fished some points picking up a few reds and drums along with some more trout. The box was looking good. With the north wind we fished the northern shorelines with live shrimp under a cork and were putting some solid trout in the box pretty much all morning. With box almost full we made drift in some shallow ponds and put 5 more reds in to top it off. All fish caught with live shrimp under a cork 2 ft. AWESOME DAY! YOU DONT KNOW UNLESS YOU GO! Dustin and his friend Dave took off Friday to do some fishing despite the windy conditions because any ady fishing is better tahn any day at work. With all the wind we had to stay in some protected coves to find clean water and trout. 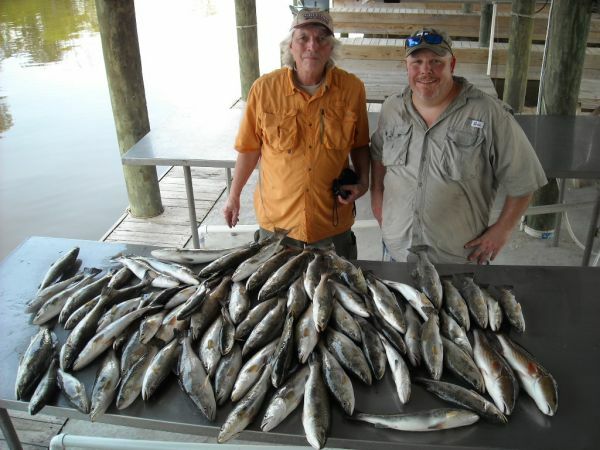 The bite was slow with few small fish thrown back but by the end of the morning Dustin and Dave had their limit of nice speckled trout in the box along with one lonely redfish. All fish caught with live shrimp and plastic under a cork. 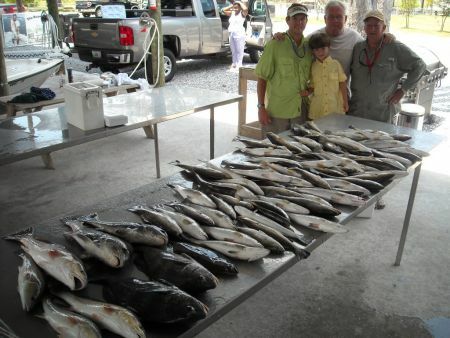 Jim bridges and sons James and Tyler booked this trip for dads birthday and what a day it was. 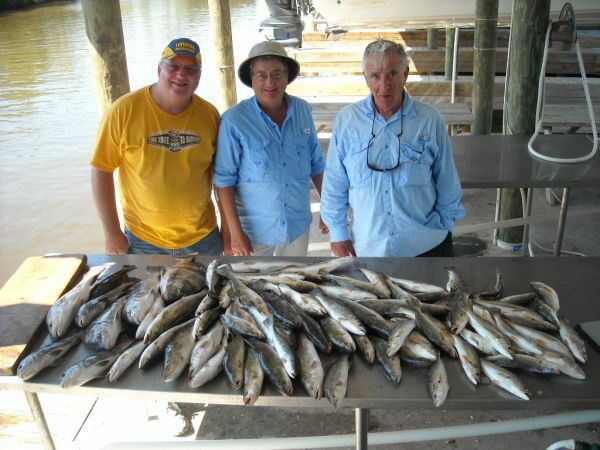 These guys had fished with me back before Katrina and had a great time and wanted to treat dad to trip for his birthday. We started a little slow bit as the sun came up the speckled trout turned. Steady action with nice sized trout all morning. With limit in the box we left them biting to search out a few reds to pull on the drags. Shallow ponds and points and the drags were running with the rod bent. All in all a great day and box full of fish. All fish caught under a cork with live shrimp and sparkle beetles. Wind is still blowing but we are still coming in with some fine catches of redfish, flounder and speckled trout.! FRIDAY was very windy again but that was not deterring Skip and Alex marks. It was opening day their first trip of the season and they could not wait to bend the rod. We started out right in some school trout having fun and few in the box. Trout were scattered so we kept on the move getting a few at each spot building a box. 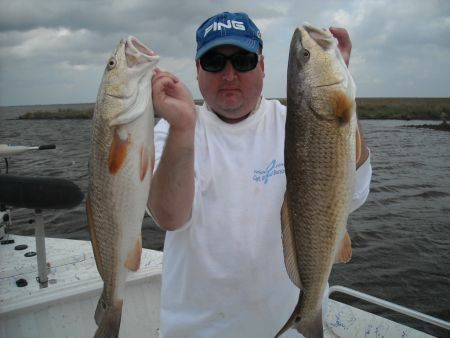 Later we put our sights on redfish and had the drags running with some nice reds. Great day and lots of fun. SATURDAY the wind was even stronger 15 -25 SE I had group from Hilti Tools on board helping out Capt Dude with a group. We started in the trout under some birds but mostly too small and the wind kept us from staying with the school. We turned our attention to redfish the rest of the day working from one point to the next picking up a couple at each and filled the box with a limit of nice redfish, drum, and flounder. Another great day in the windy marsh of Hopedale turned out great for Lisa Davis and kids Andrew ,Justin, and Danielle. Things started of quick with drum and 2 reds then got slow for awhile. Off the new area with cleaner water and fish started coming in the boat slow but steady. It was going to be build a box day a few fish at a time. Mom was really putting on show for the kids catching redfish and some nice flounder, But Danielle , Justin, and Andrew had their rods bent over as well. Nice family outing. Around 1 o clock we called it a day with the box full of nice reds, trout, drum ,and flounder another HOPEDALE GRAND SLAM! All fish caught with dead shrimp or live minnows under a cork. Knew it was going to be tough day with 20 to 25 mph West wind and Low tide, But Alan, Justin, and Jason had planned this trip months ago and came from Georgia to fish so we were going to fish and do our best. Things started out good first area 2 reds in the boat. Several stops and few hours later we only had 3 reds and a flounder. Wind was howling and dirty water everywhere. Told the guys we were going to make a big move deeper in the marsh and find some cleaner water. Got some better water couple of spots not a bite then we hit pay dirt. Clean moving water tide falling out of a drain fish on a nice red finally at 11:45. We stayed right in that area only moving the boat down the bank a little and filled out our limit of reds along with few trout ,drum, and 2 flounder, Talk about a down to the wire finish. I have to praise Alan, Justin, and Jason they fished hard and did not com-plain about the conditions and were rewarded with box full of fish. All fish caught with dead shrimp or live minnows under a cork. Windy conditions in Hopedale this weekend made things a little tough and limited areas to fish But we made the best of it and put some nice catches of fish together both days. Saturday picked few trout and worked the banks and cuts with dead shrimp under corks to put a bunch of beautiful redfish in the boat. Great day on the water with Gerry,Hugh,Kevin and his son Burt who always catches the first fish as usual. Sunday Kevin was solo with me his partner could not make it so Jus me and Kevinin some super windy condition 25to 30 mph no joke. I fished all the areas that produced reds the day before and then some but nothing would bite. On the hunt for fish mid morning found some nice trout ina protected bayou and we made the day putting 24 in the box. Tried the reds again trolling and casting spinner baits and got 2 nice ones for the grill and called it quits with the wind topping 30mph. Native born to Lousiana I have hunted and fished my entire life. 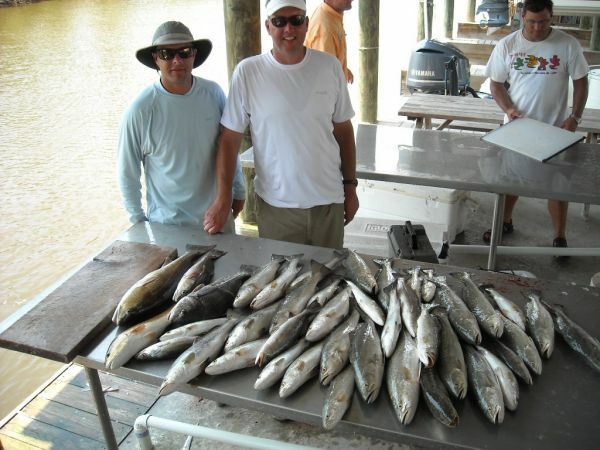 Doing waht I love to do taking people fishing and showing them why Louisiana is truly the sportsman's paradise.